Frames may be painted in a wide variety of ways. Paint can be applied directly to the moulding, or to a gessoed ground, or to an already gilded surface. Here are just a few random snapshots from the workshop. 1 A painted frame with added decorations in aluminium leaf given further detailed brushwork. 2-3 A frame may also be gilded with silver leaf, which demands the same careful application as gold leaf, or with the more robust but less bright aluminium leaf. In this case a tray frame has been gessoed and then water gilded with silver leaf, and then the inner edges painted blue. 4-6 An oil gilded moulding further enhanced by the addition of a coloured channel. 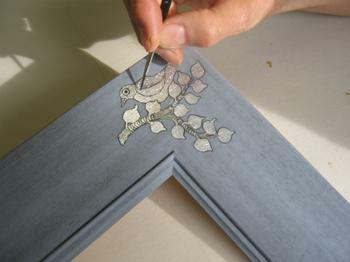 This sort of work is usually done before the four sides of the frame are joined, particularly with narrower mouldings. 7-8 A frame made from three component mouldings, applied with gesso, painted with red bole and the inner and outer mouldings water gilded with gold leaf. When dry these areas will be burnished. The central moulding painted a creamy off-white.